Rapidsoft Systems Training specializes in instructor-led IT training. Our classes are designed to help IT professionals build the skills and knowledge they need to administer networks and advance their careers. Through a combination of lectures and labs, we offer the comprehensive training solutions that individuals and companies need to enhance their IT skills, improve their IT departments, and offer new or upgraded services to customers. Our training programs are designed to help IT professionals maintain or upgrade certification levels, improve the skills needed to excel on the job and advance in their careers. As technology changes, the need for employees with job skills to match the transformation is increasing. IT professionals are needed to adequately plan, build, and run the network. Skilled employees can improve overall productivity and efficiency and can also bring a higher return on technology investments. One of the best ways to acquire the necessary networking skills to achieve these gains is through hands-on training by experts. 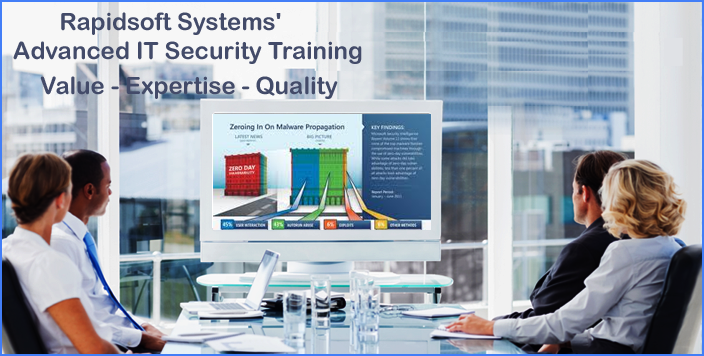 Rapidsoft Systems is a an installer and developer of network and security tools, which means that we provide the most current, accurate curriculum and training needed to pass today's rigorous IT certification exams. Headquartered in Princeton Jct, New Jersey, we offer courses at our location, on-site at your location and live-online. IT professionals can benefit from IT training by adding new skills, keeping existing skills up to date, standing out in the job marketplace, and having the potential to earn higher wages. Certifications, the end result of a successful Rapidsoft Systems Training class, are industry-recognized validations of technical skills and knowledge. Our goal at Rapidsoft Systems Training is to teach the IT professionals who attend our classes the most up-to-date information they need to know to help them successfully earn certifications, run a network and perform other technical duties required of them. Expert instructors with Ph.Ds from the top educational institutions of the world. Firm schedules provided.. On-site or of-site Tra8ining provided. State of the art equipment— All courses are Hands-on. Rapidsoft Systems Uses Cisco Routers and Advance NetSim network simulators with practice tests for exams included with CCENT, CCNA and CCNP, Security_, CIISSP etc. Guidance to take testing for any of the certification exam.